This Leather Survivor Bracelet is made with sterling silver 5.5mm alphabet block letters spelling your child's name or a favorite saying (e.g. BRAVE, SURVIVOR, DADDY). 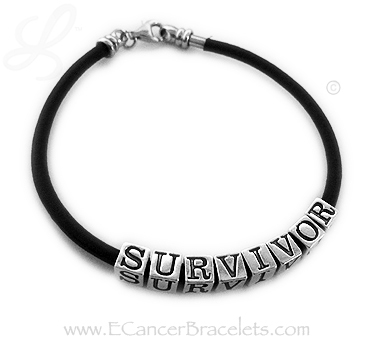 You may have as many letters or special characters, as will fit, on the bracelet. You may add spacers in between the block letters and special characters. Spacers: I can put round sterling silver spacers in between the block letters. The round balls are the size of the blocks and are also sterling silver. See the drop down menu to choose spacers or not. You will get FREE spacer beads in between WORDS or NAMES but if you want them in between letters you need to choose that option in the drop down menu below.